I had a bit of a quiet period work-wise during August, and as B had been on a couple of girls trips earlier in the year already I thought I’d make the most of it and go on a guys adventure. A kiwi mate of mine currently living in Switzerland had a similarly obliging schedule, and so we booked a week long holiday in Andalucia, in the south of Spain. Our first stop: Seville. B had actually just been to Seville recently with her little sister, so I’d heard a lot about it and was looking forward to seeing the place for myself. The main difference between our trips was to be on the accomodation side of things – B and her sister had gone for the usual nice hotel (think rooftop pool and cocktail bar), whereas we’d opted for a hostel, more for the social aspect that anything else. The difference in price between these two options was actually surprisingly little, which leads to a good tip for Spain actually – it’s a great country to go a little luxury on a budget on a big European trip. The first thing I noticed getting off the plane, mid afternoon, was the heat – I think it was 43 degrees (celsius, for anyone who might be used to some other totally illogical measure of temperature), which turned out to be about standard for the trip. 43 degrees is quite hot, and by the time I’d finished my short walk to the hostel I was sweating profusely. This also turned out to be about standard for the trip. Bring sports shirts to Spain, in peak summer. We were staying at Triana Backpackers during our time in Seville, in a private room (I’d decided I was too old and grumpy, at 28, to share with 10 other people). I’ve not really stayed in many hostels before, but this one was really cool – especially the rooftop terrace, with all its hammocks and loungers in the shade to doze away the worst of the midday heat, and the cold spa to get refreshed in. It was also in a nice part of town, close to all the main attractions but in an area which wasn’t too touristy. I’d recommend it for anyone after a hostel in Seville (the rooftop terrace was also a lot of fun after dark). First on the to-do list, once the heat started to go down a little, was find some food. I love Spanish food anyway, but I must say – Seville is just amazing for food. You can eat pretty well for next to nothing anyway, but for about half the price of a cheap meal in London you’ll be eating like a king. Patatas bravas is one of my particular favourites (essentially just potatoes covered in delicious spicy sauce), and of course sangria is a must with just about every meal. I’d say its probably best to avoid visiting Spain if you’re adhering to a strict diet. The next day we went to see the Alcazar of Seville, a royal palace which is one of the main attractions in the city. An important tip – find out where the single entrance to the Alcazar actually it, rather than just guess. If you guess wrong, as we did, you’ll find yourself circumnavigating the entire compound, which is huge, and you’ll get very warm while doing so. We finally made it and jumped in the line, which was also huge but which was processed pretty quickly. Bridget would like me to highlight here the fact that my mate and I both thought that the Alcazar was in fact called the ‘Alcatraz’ (of San Fran fame), and indeed spend much of our time in the line discussing why this might be, as she found it quite amusing. This is what happens when I travel without B – she normally does all the research, and so when I strike out alone I end up knowing next to nothing about where I am. Ignorance is not always bliss. The Alcazar, once you find your way in, is absolutely beautiful, certainly one of the most impressive old buildings I’ve seen during my time in Europe. I was also surprised to find out later that the palace is still used by the royals from time to time, making it the oldest royal palace still in use in all of Europe. We probably spent at least a couple of hours wandering around in there, but it could easily have been a lot more. We definitely didn’t see everything. On the way back through town we also briefly checked out the Seville cathedral. ‘Briefly’ because there was a mass or something just inside the door, and it didn’t quite feel right to go wandering off through that (though a lot of people were doing so). Very impressive, but I didn’t realise at the time just how large it was – it is in fact the third largest church in the whole world. It therefore might be a good idea to dedicate slightly more time to looking through it than we did. The giant golden wall looked very cool. 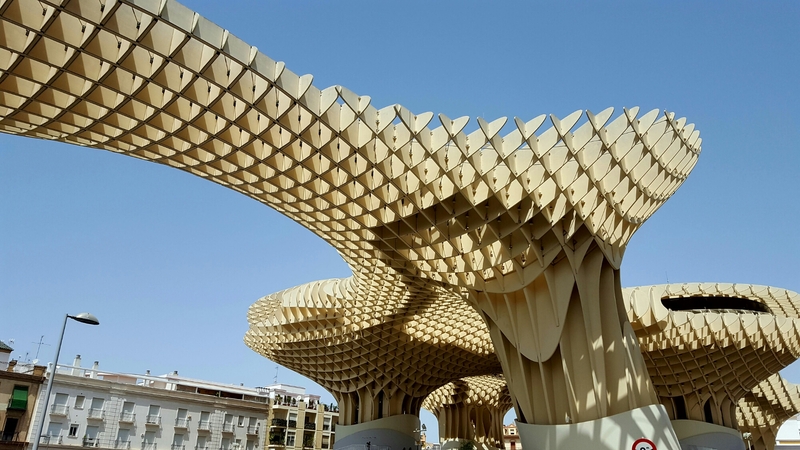 The Metropol Parasol is a fairly unusual thing. You may not know the name, but you’ll definitely know it by sight – its that weird, massive architectural structure right in the middle of Seville, which is where we visited next. I find it really hard to imagine the build plans for it ever getting signed off in such a historic old setting, though I’m glad it did as I actually quite like it. But it certainly is bold. On the top level of this distinct building is a viewing platform and small cafe. We chose perhaps the worst possible time to visit the viewing platform – right in the middle of the afternoon. There was only one other tourist up there with us, but this was because the reflective metal meant that it was at least 10 degrees hotter than on the street below. And given it was 44 degrees on the street below, the viewing platform was close to unbearable. I think we lasted about 5 minutes before we had to hit the air-conditioned cafe for a survival water (a drink was free with the ticket, which made a lot more sense at that point). 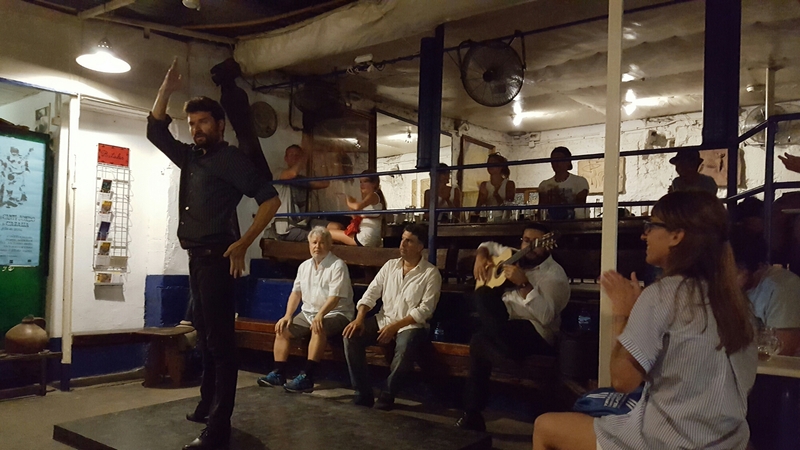 Later that evening we went to see a flamenco show. There are heaps and heaps of these all around Seville, at varying prices, so I could see it being a little bit of a challenge picking the right one. Bridge liked the one she went to, so in the end we just decided to go with the tried and true as well: La Carboneria. This place is a slightly difficult to find, if you were navigating using Google Maps as we were, but persevere – it is right around the corner from where you’ll end up. 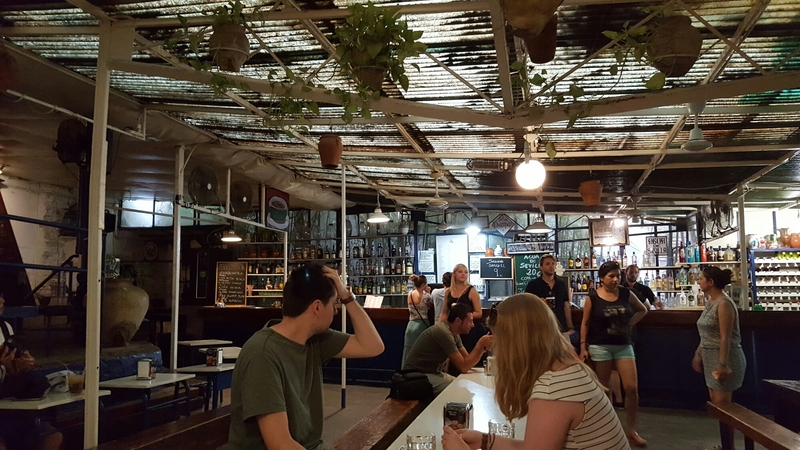 La Carboneria is free to get into, and the drinks are super cheap (€2 for a glass of vino tinto), but the thing I liked most about the place was the atmosphere. After a couple years of touristing around Europe what I prize most nowadays is an authentic experience, as opposed to a tourist show, and this was exactly that. It felt like a locals bar, and I loved it for that. The music and dancing were awesome as well, so all in all a top show. The next morning, we packed up and headed for the bus stop and the next leg of the trip – Cordoba.